Hot off the press! New exclusive alphabet wafer paper & pick designs, by Sarah Berkheimer. These whimsical wafer paper cookie designs and make-your-own picks are a creation of adorable, lively animals perfect for creating cookies or cupcakes that are unique and fun! The picks are printed on cardstock – all you need to assemble are toothpicks and glue. Spell out your child’s name or a celebration with these cute and colorful letters. Or use the wafer paper designs with a batch of royal icing and affix to homemade sugar cookies for a real treat! Each set includes 156 pieces, three sets of uppercase letters and 3 sets of lowercase (either printed on wafer paper or cardstock) – plenty for numerous celebrations for years to come. Find these and other stunning wafer paper designs at fancyflours.com. Fancy yourself a fancy cupcake! Cupcakes never looked as good as they do in this NEW colorful Astrid cupcake liner pattern, available at fancyflours.com. Perfect for birthdays and summer celebrations! Match a couple of the fun colors in the cupcake liner, with your icing colors to get a coordinated look that will have your birthday boy or girl giddy with excitement! We used simple colored candles, but fun shaped or number candles are a unique twist. See some of the candle varieties we carry at fancyflours.com. For a 3D border, try using a standard shell or star tip and carefully frost your way around the top of each cupcake in a contrasting color from the base layer. Find more fabulous muffin cups, cupcake wrappers and creative cupcake decor at fancyflours.com. From NOW through FRIDAY, June 6 take 15% off your order at fancyflours.com MUST use coupon GOODIES at checkout at fancyflours.com! Celebrate birthdays in style with cheerful wafer paper designs perfect for birthdays! Creative “Make Your Own Birthday Picks” are a simple way to jazz up a ordinary batch of cupcakes and you can add on additional details to the picks, like shimmery dragees and edible glitter with a touch of edible clear gel. A great idea for a fun twist on the regular sugar cookie – bake sugar cookies in the shapes of birthday cakes! Our Three Tiered Cake Cookie Cutter is a the perfect shape for our new Happy Birthday Cake Wafer Paper set; complete with candles and all! Affix wafer paper with edible clear gel, sprinkle a layer of white edible glitter, and package in individual clear bags to give as party favors at a birthday celebration! Topsy Turvy Cake is Fab! One look at this unique little cookie and one is taken back to childhood. 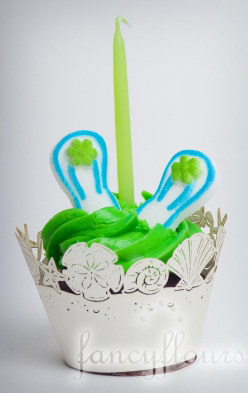 This whimsical themed cookie cutter screams birthday and wedding like no other. New to the Fancy Flours line up are these dazzling cookie texturizing sets. This one comes with the topsy turvy cake cookie cutter and three different texturizing mats. You can use the texturizing mats on unbaked cookies, leaving an imprint in the dough itself or on frosted cookies to leave in an imprint in the frosting. 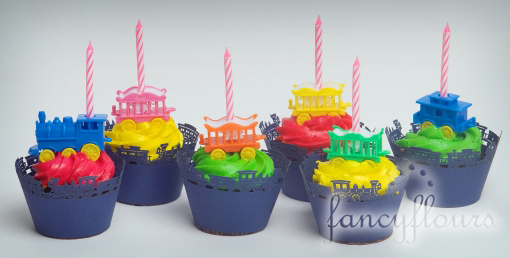 Take it a step further and imprint into rolled fondant. Attach the fondant cut-out to your cookie. Whip up a batch of your favorite Sugar Cookies (try our No Fail Sugar Cookie Recipe) and get to decorating in style! Topsy Turvy Cake Cookie set and other cookie texture sets can be found at: www.fancyflours.com.